As we moved around the country following my dad in his Army career, I encountered other events that would shape my spiritual awareness. Some of them were not as positive as the first. My mother had left my brothers and me when Dad was in Vietnam. When my dad returned to the United States, there was no way he could take care of us by himself, with Army life being what it was at the time. So we were enrolled in the Southwestern Christian Children’s Home. It was as close to going to a parochial school as you can get without being Roman Catholic. We were required to attend chapel, devotionals, prayer times (that seemed to last forever) and church on Sundays. But the most vivid memory I have of that place was a picture of Jesus on front wall of the study hall. 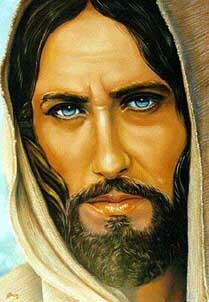 This wasn’t your nice, loving Sunday School kind of picture of Jesus. Oh, no. This was a “Jesus on steroids” kind of picture. He looked like he had really had enough of kids for that century and was about to blow a fuse (the picture probably didn’t look anything like that, but that’s how I remember feeling as a kid). The worst part of the picture, though, was His eyes. The painter had done a fantastic job on the eyes. They were penetrating and seemed to follow you everywhere you went in the room. You didn’t goof off in study hall because “JESUS WAS WATCHING YOU.” So this experience wasn’t the most positive, but God would use it to His benefit in the future.